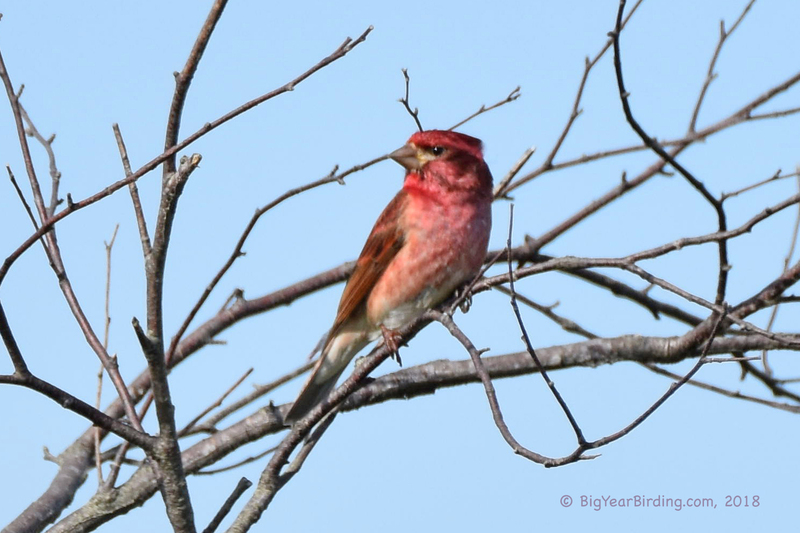 The Purple Finch is closely related to the Cassin’s Finch and the House Finch, and in fact, there are places in Washington where all three species can be found. All three species are streaked, and the males of all three have red plumage. Male Purple Finches typically have brown undertones on their backs and wings, but are reddish-purple overall (with the exception of their white bellies), with the brightest coloring on their breasts and heads. Female Purple Finches are heavily marked with short, blurry streaks on their breasts and have white markings on their faces. The breast streaks do not converge in a central spot as on many sparrows. Unlike the House and Cassin’s Finches, Purple Finches typically lack streaks on their undertail coverts. Purple Finches have short, notched tails and straight bills, although not as straight as those of the Cassin’s Finch. Males take two years to reach mature plumage, and first-year males look like females.